At 8.00 am on 26th September 2007, when the monks arrived for gathering at the Shwedagon pagoda, there were about 60 military vehicles. Many of members of USDA, Lords of the Power, former prisoners many unknown were already at the pagoda. On 27th September 2007, soldiers, security forces and members of USDA were everywhere in Rangoon. I personally witnessed that the troops fired and killed the protester, including the a Japanese. At night, the troops violently raided South Okkar Ngwe Kyar Yan Pariyantti Buddhist monastery. Continuously, more than 40,000 monks, nuns and students were arrested. On 29th September 2007 onward, the junta cracked down the demonstration by using all kinds of methods, and curfew was declared for 45 days at that night. Through I had conservation with the trustees of the pagoda, who were the ranks of Mayor and general in military services, the attempt of compromising failed. In a event of answering the questions from those trustees, I explained the relationship between citizens and the state, and the role State (government) to care for the people. According to the list issued by all Burma Monks Association, there were 27 death and 9000 detainees. Such inhuman action and for the goodness of the people as a whole till the attainment of second independentce. Failure to be the services of the state, the SPDC ordered the Chin Troops from light infantry battalion (77) arrived and killed the monks, students and people indiscriminately. In the incidents, U Sandar Thiri and three monks were killed. About 1000 of monks, students and people were injured. Nearly 6000 were arrested. Five monks and seven students wrer beaten to death inhumanly under custody. Politic is not a business; if politic becomes the source of income, opportunity for your own (Burmese) people at large will never get rid of Burmese military dictatorship yoke. I’m one of those who walk blindly in my life journey. As I love my life, I also love truth. If I have to select between these two, I will select the truth, against the survival at my life, if once again blood is needed for our cause, that blood drop of blood should be mine one. Saffron revolution was the outcome of inhuman action and maladministration of the military government (the janta). I, Ashin Htawara, personally partake in a movement. In 2007, the rising price of basic needs and petrol drove the 88 generation to stand on the road and demand for relief. People have been suffering from poverty as well as oppression over 6 decades. I a situation of constant fear, Monks followed the Buddha’s ritual and stood with the justice for the public. On behalf of the suffering people, monks stepped up on the road and prayed for compassion in the purpose telling the state indirectly to perform is duty to care the people. Accusing monks undermining religious teaching by performing religious demonstration, U Pyinnya Sakka and U Pyinnya Nandar ewre tide to the lamp posts and beaten brutally by SPDC members. This brutal action was unusual and motivated the justice defenders to partake in religious demonstration. Among them, supporting All Burma Monks Alliance’s statement, Ashin Htawara distributed leaflets protesting SPDC’s lawlessness activities to monasteries and among the public on 6th September 2007 in Rangoon. On 19th Sep: 2007, he was offer as the General Secretary of ABMRC after his active participation in demonstration against the junta on 17th September 2007. After the ABMRC was cracked down, the janta announced through kyimon newspaper to arrest him on 25th October 2007. He therefore to Rakhaine Mountain Ranges, continuously to Takkanar port on the Bangladeshi border on 22nd January 2008. Currently, he is fighting the junta from the office of ABMRC in Bangladesh. Peacefully pray of compassion is the Buddha’s mean to end calamity. Instead of advocating Buddha’s ritual, the janta through they believe in Buddhism treated monks as enemies. This treatment is the worst history of the junta in history of Buddhism of Burma. Ultimately, the monks who abide the pure Buddha’s ritual obliged to conduct ‘pattaneikkuzana’ rite, the rite of excommunication to halt the inhuman act of the junta in current as well as in future. 1. An attempt preventing the monks from obtaining four types of sub- stantive things. 2. An attempt endangering the monks and preventing him from material developments of substantive needs. 3. An attempt preventing the monks from residing the appropriate place. 4. An attempt abusing verbally abusing ten types of swearing. 5. An attempt splitting up the integrated body of monks. 6. Censuring the benevolence of Buddha. 7. Censuring the benefit of Buddha’s preaching. The above 8 factors could drive the Monks to conduct the rite of excommunication for the sake of Sarsana and of the goodness of the people as a whole. Unbearable over the suffering of the civilians, around 500 monks marched on the road in rows and recited the compassion prayer for the people while demanding the SPDC to tackle the problem of substantive needs of the people. However, instead of performing the state’s duty, the SPDC exposed its real attitudes of power preserving by ordering to brutally crack down the Buddha’s ritual and people’s will. The incident of tying and beating U Pyinnyar Sakka and U Pyinnyar Nanda to death was the good instance of SPDC’s evil action. The sufferon revolution, beginning at 11:30 am on 17th September 2007, was the outcome of the inhuman action of the SPDC. More than 1,000 monks, 5,000 students and people marched on foot from the Shwedagon Pagoda, reiting prayers for compassion, and ended at 4:00 pm. During marching through the appropriate routes, many people took out of their home and offered the medicine, clean water, etc. On this occasion, monks were forcible forbad the climp up into the platforms of the Shwedagon pagoda, the Sule pagoda and the Potataung pagoda and in middle terrace the Shwedagon pagoda, there were full of military vehicles and of soldiers, member of Union Solidarity and Development Association, Lords of Power and Security Polices who are ready for action. At noon on 19th September 2007, more than 10,000 monks and 70,000 students and people marched and recited prayers on foot from the Shwedagon pagoda crassing through American Embassy, India Embassy, Theigyi market. 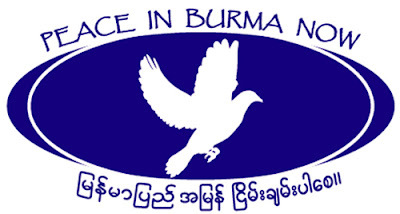 In the evening, all Burma Monks Representative Committee, composed of 15 monks, was formed with the support and wishes of all monks, nuns, students nuns people. On 20th September 2007, marching prayer was going on. At the same day, there was a rice offering ceremony for the monks at Kyaikkasan township, arrange by General Myint Shwe, Rangoon Division Commander. The attitude behind the ceremony was to reduce the strange of marching prayers. The attempt of the junta failed because under the command of the excommunication rite (Patteaneikkazana) performed by ABMRC, no monks shall accept the donation from military personals. In order to fullfil the substantive needs of Monks (monastery, robes, alms and medicine).. a group of 15 persons was formed with the support of public. On 22nd September 2007, marching from Shwedagon pagoda at noon, while crossing current Daw Aung San Suu Kyi’s house, she came out of her house to pay homage to monks. The monks stood in unison and recited compassion prayers about 15 minutes and she politely was listening with falling tears while over 30 members of security police standing in front of her. Saffron revolution inspired the sprit of thepeople. Bases on the sprit of justice, people raised the slogans repeatly “May Mother Suu be in good health”. “Success to the Democracy Struggle”. During marching the prayers on 23rd September 2007, Ko Aung Way (the Poet), Ko Kyaw Kyaw (Chairman), Ashin Htarwara (General Secretary of ABMRC) deliverd the speeches for unity, development and reconciliation. I concluded that if the junta does not work on solution, our monks will join the people partaking in the saffron revolution without fear till the end.